Hi, hopefully you did not stop the hard reset process in the middle of formatting, because it can make your Asus Fonepad fail to work. You can try to do hard reset using hardware button combination key again one more time, if your tablet still not work, then you need to check at Asus authorize service center. why my asus fonepad 7 screen is blank (white then change to grey), why ? its fine before that. Hi, if you still can not turn on your tablet, then please try to do hard reset or reformat using hardware button combination key above. hi, i’m using asus fonepad 7 (fe170cg) and it has been updated to Android 4.4.2. now my fonepad always stuck when i use it for browsing or another apps. is it good to downgrade or hard reset? also, my fonepad can’t be used for wifi hotspot (thethering). any suggestion? Hi, if you get trouble after doing update to latest firmware, we suggest to do hard reset to restart or reinstall all applications to latest update one, including some apps from Google Play Store need to reinstall again at your Asus Fonepad 7. Hi, my asus fonepad7 fe170cg is upgrade to 4.3 to 4.4.2 then i got the error when i switch on the mobile network wifi is auto turn on everytime so how to fix my fonepad plz give me instruction. Hi, sometime some features can not work normally after upgrade. However, this problem usually can be solved after doing hard reset, but please do not forget to backup all important data first before doing hard reset. I have Asus phonepad 7 FE170CG . Today, I did update aplications and system update. After instalation, my tablet didn’t want to start. When I press power button, I just feel vibration at start and that’s it. No screen logo. Nothing. I didn’t try any reset. What to do? Hi, at normal situations after doing update firmware then your phone will run without problems, unless if the system update corrupt in the middle of update. However, you can try to charge again the battery untill full and try to hard reset again using hardware button combination key. If this phone still have problems, then you need to bring to Asus authorize service center. hello i need help how do i deactideactivate the demmo App? Its very annoying. Every time im charging Itália comes up, or when i want to block the screen the demo app keeps playing and my batery keeps wasting. Hi, we are not sure about what is demmo app, but please try to do hard reset or master format, then usually your Asus Fonepad 7 will reinstall clean factory default Android operating system and applications. If your tablet have additional installation for demo apps, then that apps should be not install anymore unless you do manually. Hi, please try to do hard reset or master format your Asus Fonepad 7 to reformat the operating system to factory default, sometime this problems happen because of applications crash that make your operating system damage and effect to network setting. I bought FonePad 7 2 weeks ago..and having problem recently. It took so long to get fully charged about 12 hours..I’ve tried different chargers but same problem exist. Pls help. Hi, have you ever try to reformat or hard reset your Asus Fonepad 7? Please try to do it, then after that try directly to recharge again and wait whether it charge faster or not. Or other alternative, turn off your Asus Fonepad 7, then try to change it until full, it should not more then 4 hours for the battery become fully charge. One day my Asus Fonepad just decided to switch off by itself, and on switching it on it never completes the boot process, even if left for a long while. Before that, it was hanging a lot. How can I rectify this? Hi, maybe some installed applications was crashing and make you Asus Fonepad 7 operating system become damaged. Please follow steps to hard reset using hardware button combination key. hello i did the factory reset for my asus fonepad because of “unfortunately process com. android. phone has stopped” problem occur. but my fonepad wont start properly. it work once. but the same problem happened again. i did the factory reset again, but the resetting page wont appear cause it buffer for hours. and if lucky that page occur but that “unfortunately process com.android……” appeared and there is now way i can finish my phone setting to the last page because after few ‘ok’ click it will turn to the 1st page. Hi, maybe your Asus Fonepad 7 get trouble with hadward, therefore that problems still appear although we do hard reset or reformat. Please consult with Asus authorize service center for further help. Hi, Please talk me about Reset SD DOWNLOAD. I have ASUS FonePad 7 model K00E. I’m from Bogota, Colombia. Thanks. Hi, you can try to hard reset or master format your Asus Fonepad 7 K00E using software menu, otherwise if your tablet can not boot normally then please try to use hardware button combination key for reformat or hard reset. after i did the factory reset, it hang forever at the asus l logo, anyone know what is the problem ? Hi, maybe you have stopped the factory reset procedure while it run or not finish. I find this fonepad fe170 too slow. I done the inicial lolipop and firmware update. Do you recomend to do a hard reset now? i hope the fe372… runs fast. But still is the best experince using it. Hi, at your condition the answer is yes, we recommended to do hard reset or reformat your Asus Fonepad 7 to restore all setting back to factory default and remove unnecessary applications. Hi, if your white screen showing only when you open browser, then maybe something happen with your Asus Fonepad default browser, please try to install several 3th party browser like Firefox or Opera Mobile. If this problems still happen not only at your browser, then we suggest to do hard reset or master format. After your Asus Fonepad tablet can boot normally again, then please try to browse it again. i forget my password,so not open the tab my asus 170cg.please help…..
Hi, first you can try to unlock or restore forgotten security password at your Asus Fonepad 170CG using Google username and password. This is the steps: please turn on your Asus fonepad 7 tablet, when it ask for answer try to do give several time wrong answer continuously until your Asus Fonepad 7 freezing, when it freezing or locked then you can find Forgot Password button, press this button then please give your Gmail username and password that you have already signed-in before. If you still can not access your Gmail account for unlock forgotten password, then you have to do hard reset with hardware button combination key. hi, i m having problems with my asus fonepad 7. It doesn’t tend to detect wifi connection right after the tab has been completely reformatted. i had to wait for three whole hours for the tablet to connect to the internet. Please help me urgently. Hi, you have to try connect with different Wifi Access point just to make sure your Asus Fonepad 7 wifi radio hardware get trouble or not. Ive done a system update yesterday on 5.0 version, all is great except the speaker does not work. when connected on headset it has a sound.any suggestion how to fix the problem? Hi, normally it will work after we finish update or upgrade the operating system version. But at some conditions maybe you need to do hard reset to make sure all old applications not get trouble at new version firmware at your Asus Fonepad 7. But please do not forget to backup all important data before doing hard reset. Hi! Im Cris. I also own an Asus Fonepad7. Unfortunately, mine is not workinh as well. I have been told that the power IC is damaged and i can only get a replacement from other Asus Fonepad 7. And so i’d like to ask if you could sell your defective Fonepad. I badly need to have our tablet fixed bec my 4yr old son will use it.. THANKS! God bless. Hi, hopefully someone else can give information for what you need. However, usually Asus authorize service center have some component to replace when it is damage, maybe you can consult with them as well. Hi, if after doing firmware upgrade of Asus Fonepad 7 to Android Lollipop but your tablet can not work normally, then please try to do hard reset or reformat to clean all installed applications. Because sometime some old applications can not work properly with new firmware versions. But please do backup all important data inside your Asus Fonepad 7, After doing reformat, then you can setup again your Asus Fonepad 7 K012 like new and sign in with Google account again. hi! i have a problem with my asus fonepad k012, its always stop the apps if i use it. i already reformat it but after 10mins or more of using it the apps stop gain. what should i do to fix it. thanks! Hi, we worry after doing reformat or hard reset Asus Fonepad K012, you signed in again with previous Google account. Please try to hard reset again your Asus Fonepad K012, then after your tablet boot properly, please do not login with previous Google account or Gmail account, just leave it without Google account, or you can try to create new temporary Google account to test your tablet download several applications from Google Play Store. Usually it will work normally again. If your Asus Fonepad tablet still get the same problems, then please bring to nearest Asus service center for further check. Mine is Asus 175CG. When I tried to update sagain ssage ” Erasing” with android logo &I switched off . Hi, we suggest to use fast Wifi data connections to do firmware update using OTA, otherwise you will get very long time to download if your GSM network provider is slow. Hello, my Fonepad 7 is stuck in reboot loop installing system upgrade, how to stop it and how to flash ROM when I don’t have access to internal memory to put the ROM zip file ? My fonepad 7 turn black screen while download movie. And its still black screen if I turn it ON. Even if I press the power+volume increase it still black screen. Why does it happen? How can I fixed it? Hi, the blank screen or show black only at Asus Fonepad 7 can be happen because of some trouble, first because of damage or corrupt operating system or the other possibilities is because the screen it self get trouble. Please try to force reboot or force shutdown your Asus Fonepad 7 by press and hold POWER button until your tablet shutdown by itself. After it totally off, please try to turn on again by press POWER button, you will see something or logo at LCD screen, that it mean your Asus Fonepad 7 LCD screen is fine. However, if you also not see anything at your screen, then maybe your LCD screen get trouble and need to have further check at Asus authorize service center. hi..i’ve got a problem with my asus fonepad 7 me372cl..after i fully charged n turn it on, it got stuck at buffering ‘asus in search of incredible’…what do i do? n one more thing, before this happen, ‘the process com. android acore has stop unexpectedly’ always pop up, why is that? lookinf forward for your reply, thank you..
Hi, you should try to do hard reset your Asus Fonepad 7 with hardware button combination key to reinstall the factory default operating system. Hi! I have the same problem with xdenama. I boght Asus K019 just 3 days ago and every time I turn it on after self shutdown, the default keyboard always change back to Asus Keyboard. Hi, we suggest you to try doing hard reset or reformat your Asus K019 operating system to factory default, mostly this problems comes with installed applications. But if after finish hard reset, your Asus K019 still get the same trouble, then please consult with Asus authorize service center, especially because your Asus still have warranty to fix hardware trouble. My Asus Fonepad 7 turns to white screen. I turn it off and remove my sim card and memory card. Then let it rest for about an hour. When I opened it, only white screen appears. Hi, you have to try doing hard reset with hardware button combination key. This process will reformat your Asus Fonepad 7 operating system to factory default. If your trouble comes from operating system or applications, then this process will fix your trouble. Hi, you have to make sure your front camera is work properly. Please try to use camera apps and see your face from front camera. You also can try with your friend to use Skype or Hangout or other similar video chat apps if your front camera is working properly. I have a problem regarding with my ASUS Fonepad 7. The battery is fully charge but when i open my tablet, it power off itself. I open again my tablet but it still do the same. What should I do? Hi, first you have to do hard reset first. 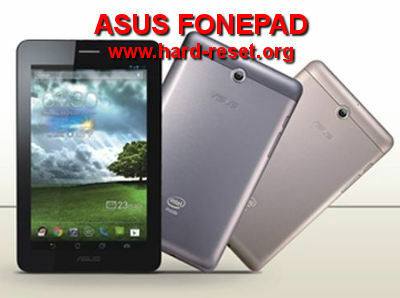 If you can not start your Asus Fonepad 7 properly, then you can do hard reset or master format using hardware button combination key. If the problems comes with battery hardware, then this process will not fix that problems, you need to consult with Asus authorize service center to check your battery whether still fine or not. Hi, you cannot downgrade Asus firmware using OTA like what you did when upgrade the firmware. Maybe you can do with reflash custom roms, but we are not recommended to do that, because some wrong steps can make your tablet become trouble. However, you can try to do hard reset to clean all installed apps to factory default. Maybe it can solve your problem. hello. my asus fonepad had a main ui error i think. the error keeps on popping until i try to restart it. but it suddenly go on a boot loop. the asus logo keep on showing. Hi, you have to do hard reset or master format your Asus Fonepad 7 to reinstall the operating system. Hopefully it will fix you trouble with user interface applications. Hi..using fonpad 7 model k012..first thing.. it was bootloop stuck on asus logo.been trying all the step given but neither works the worse thing couldn’t access recovery mode..and now whenever i power up the asus logo is gone and the screen is black but when i turn it off a flashing light pops the black screen. any suggestion is highly apriciated TIa. Hi, if you have done all steps options above but still can not fix your Asus Fonepad 7 bootloop, then maybe the hardware get any trouble, you should discuss with Asus authorize service center for further help. Hi, by default all installed applications will use internal memory, unless you do some tweak or rooted, but we are not recommended to do that because some wrong steps can make your Asus Fonepad 7 become trouble. Hello my ASUS FONEPAD, got a real big problem, first its show stuff saying “unfortunately system Ui stopped” then the settings stopped, then some apps stopped then the luancher have stop I tried to reset it but after that it won’t turn on and then it’s stuck with its logo what do to? I aready brought it to a ASUS service center but they can’t fix it, please give some advice they say the mainboard was the problem and it can’t be fix is it true? Hi, usually after you have do hard reset to factory default then your Asus Fonepad will reinstall to factory default operating system. But if that steps still not help then maybe they are some hardware trouble like what Asus service center said. Sometime because the hardware of Asus Fonepad already corrupt, then you can try to ask help at other community like XDA Developers which some member have tried to install with custom rom, but it will not always fix problems or not always work at broken Fonepad. Hi, at standard rom or operating system or non rooted Asus Fonepad 7 tablet can be restore back the operating system using hardware button combination key. Unless using custom rom or the operating system file source damage, then it can be happen. Please bring your Asus Fonepad 7 to Asus authorize service center to get further help. Hi, please check your phone internal storage, it still have enough room, then maybe your WeChat applications need to reinstall again at your Asus Fonepad 7 tablet. You also can try to remove Data files from menu Setting > Apps > Downloaded, and choose WeChat apps, then press Delete Data / Clear Data. After you clear all data at WeChat apps, your chat history will be wipe or remove from Asus Fonepad 7 and need to re-sign-in again with correct phone number or login user. In my asus fonepad7 both simcards gets disconnected automatically after 4.5min exactly, and now updates are also not coming, please give me a solution. 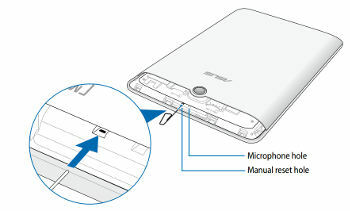 Hi, there are some possibilities that can make your Asus Fonepad get that trouble. But we suggest to backup all important data and please perform hard reset either using menu setting or hardware button combination key to reinstall Asus Fonepad factory default firmware. Hi, maybe you should try to do hard reset first with factory default operating system, then after your Asus Fonepad 7 back to factory default firmware, you can try to follow standard steps to upgrade with newer operating system. If still fail, then you need to consult with Asus authorize service center. Hi, it is depend on what kind of launcher you use at your Asus Fonepad 7. Usually after install the applications, the icon will be stay inside application list. Please find it there. Or you can try to install other applications. This information maybe not work with some custom rom. Please consult with Asus authorize service center if you still get same problems. Hi, usually when you press hardware button combination key, your Asus Fonepad 7 will show recovery menu. But this process will not work if your tablet get hardware error. Please bring your Asus Fonepad 7 to Asus authorize service center for further check. my Asus ponepad 7 is not recognized by my computer. says malfunctioned, tried with a different computer, still the same answer. done a hard reset too. nothing happened. same situation. Hi, you have to make sure your computer also installed with Asus Fonepad driver. Otherwise it will not recognize your Asus Fonepad 7 usb connection. Hi, best and safety steps to upgrade is using OTA (over the air), we suggest to use wifi to download updated firmware. Please check from menu Setting > About. Then find whether your Asus Fonepad 7 already have update firmware or not. The seconds options is go to Samsung authorize service center, then you can ask latest firmware upgrade from them. Hello, my fonepad 7 wifi is not working after factory reset. Its wont connect to wifi . Please help me. Hi, usually after finsih reformat, your Asus Fonepad 7 will work like new again. Please make sure you choose correct wifi access point with true password input. my asus fonepad7 is not responding for charging and couldn’t on because of lack of power . . Could you please suggest me what to do?? Hi, please try to use different Android charger or other charger Asus Fonepad 7, because sometime this problems happen because your power charger get broken. * help me, my asus fonepad 7 k012 having a biggest problem! * if you so kind, help me. it is stuck. * my phone, is rooted and theres an error, i cant play youtube, google play and google apps. i tried to format it by using a master format, and then it erase everything. * it took so long and then, black screen appeared. i was thinking that it still in format. after that, asus logo and intel logo are appeared. * after appearing these logos, it start to loading. * wanna know what happen, dude? it stuck at the logo, forever. *what should i do now, dude. my brother help me with everything he know until he give up. * please… help me with your experience. tell me what should i do…. Hi, unfortunately we can not give good answer for rooted or custom tweak Android at Asus Fonepad 7. Please bring your Asus tablet to Asus authorize service center for further check. I have Asus Fonepad 7 K00Z – 1 sim slot. Few times it block during call (screen turn into black), I shut it down-pressing shut down button long, and after that turn it on but now I can not. I try hard reset but on this model I can not find rest hole. I screw screwers but stil can not find hole. Please help!!! Hi, please try to use hardware button combination key to hard reset this asus fonepad 7 tablet like steps at option 2 above. I downloaded and scanned my tab to a few anti viruses app to see if thats the problem but none found. I also cleared all cache and data of my music, recorder but it still doesn’t fix the problem. Hi, we are not see at your story that you have done hard reset or master format. Please try to do hard reset to reformat your Asusu Fonepad 7 operating system to factory default. Hi, if you have done hard reset or reformat the operating system to factory default but still get some troubles at your Asus Fonepad 7, then maybe the hardware got problems. You have to discuss with Asus authorized service center for further help. Hi sir my fonepad 7 can’t detect on my computer because it’s stuck on Intel logo any suggestion to do sir? I’m so damn down right now please help me. Hi, please try to do hard reset using hardware button combination key like steps at #option 2 above. It will reformat your Asus Fonepad tablet operating system to factory default.